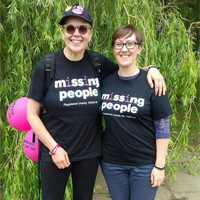 Ju Blencowe, a returned missing person, writes a stunning blog post about how she raised money for Missing People by completing a gruelling two-week walk from Staffordshire to London. 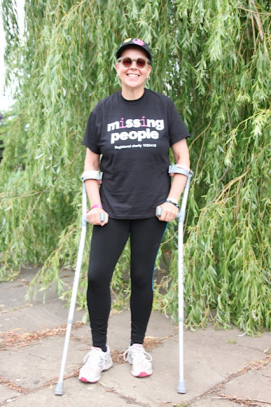 Ju's accounts are incredibly powerful and give a real insight into how it feels to be missing. One year ago this Sunday, a month after returning home from being a missing person, I embarked on a life-changing walk. I had suffered a mental health breakdown and instead of accepting more treatment, I started to walk. I felt free under the sky, untethered. As I walked more and more miles from my home with the dog each day I reflected upon my missing experience and would constantly awake in the night thinking of those still out there. People who I had met during my own time away and people who I had heard about through the Missing People charity. I had been a social worker for twenty years, my heart was an empathic one, I couldn’t just gracefully bow out and forget, return to life and move on, I had to do something. One evening, sat eating dinner with my wife, I quietly muttered under my breath, “I want to walk back to London for Missing People”. She smiled that encouraging smile, the one that says “ well, if you’ve made up your mind, who am I to stand in your way”. And so, over a two week period we sat around our table, maps spread across it and together we fathomed how, after a major breakdown, weakened from self-neglect, having never used a map before, I could walk 183 miles from our home in Staffordshire to London. 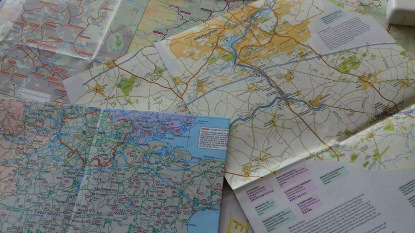 I would follow the waterways, GPS tracked, my supportive wife would come behind in our old retro caravan, so dilapidated that every time we shut its door something else fell off it, a window, a shelf. But it provided shelter, a place to soak feet, sleep and prepare for the next day and I became extremely creative with gaffa tape! 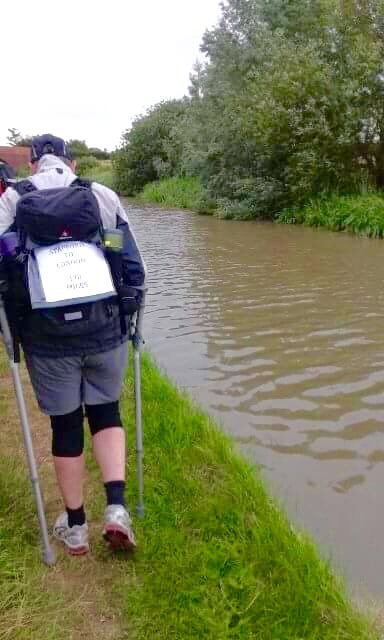 The walk would take me through several counties, during the hottest summer on record for years, I would reach breaking point on more than one occasion and on some, especially at Bridge 101, I would emotionally remove the baggage that had weighed me down for decades and dump it in the cut. 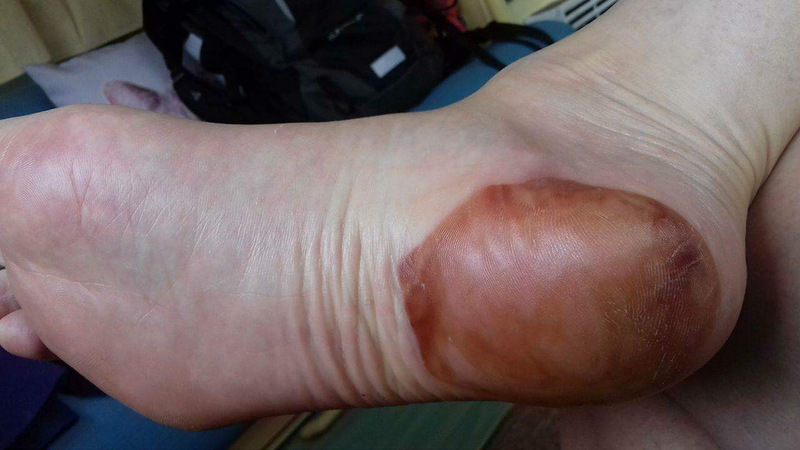 On day two I injured my ankle badly due to a long-term congenital problem and the constant physical stress and the blister plaster under my heel melted and burned into my foot on the 32-degree towpath. I would do the whole walk on crutches. 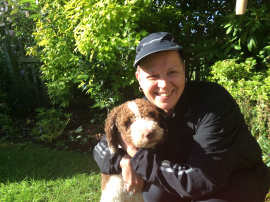 I was no athlete to start with, now I was a hopping one, a doggedly determined hopping one! 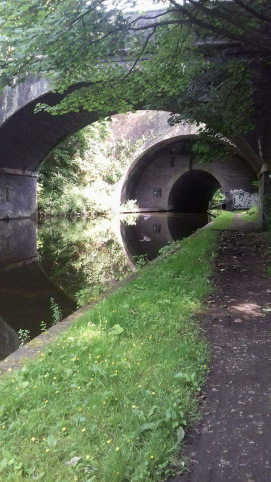 I became lost under motorways bridges, met dead end padlocked gates with no means of escape from the steep overgrown embankments, used my crutches to hack out pathways, sat on snakes, sidled past rats in dark tunnels and saw a side to the canals I naively never knew existed. I met people who were lost and people who had lost others, it was a deeply humbling journey. As I walked I could hear the distant echoes of the weeks before, the kindness of strangers, long nights, lost days, police, hospitals, inertia. What I initially thought would be a process of walking from town to town with a thankful spring in my step became a pilgrimage, a mental mountain where the pain of every step made me concentrate purely on the now, the next mile, the next bridge and where I had to face some of the harsh realities of my past, a past that had been peppered with loss and challenge . When it got too much, my missing people mentor was on the phone urging me on, listening to the gasping tears of exhaustion and grief. And the music I played in my headphones pushed me on one step at a time. Every day I spent time reflecting on the last ten chaotic years as a carer for my best friend and confidante, my mum, tormented by dementia and reliant on me for her security, protection and care. I had rarely left the house for years,I had no idea how to exist without her, no voice to listen out for in the night, no more battles to fight as her advocate, no one to sing to in the day when she held her head and cried, no one to encourage to eat, reassure with a gentle stroke of the hand. Every step mattered, every painful step pushed me nearer to the city where I had lost myself and I thought of those still missing and wished them home. I made it, two weeks later I arrived in London, met by the lovely Bryony from Missing People. That night my wife gave me a beautiful bracelet engraved with these words; “Sometimes you have to fall before you can fly”. I could finally find closure on my missing time. So, it has been a year now and that year has been spent recovering and finding joy in the rhythms of life that had for so long been neglected. Where I have been enabled to I have thanked those who helped me. We have learned to live with little after losing our work and income, an impact of caring that I had ironically lectured on in university so many time before. We have found joy in the purest of things, fresh air, birdsong, playing ball with the dog, watching a flower grow from seed. I have returned to my first love as a writer and musician and have been writing a memoir of my missing experience, 40,000 words on and I am looking forward one day to finding a literary agent and to hopefully seeing its publication. I am writing music and working with a wonderfully creative producer in London on an album and I continue to be committed to the supportive and ever-present charity Missing People. To those reading this who have loved ones missing, I have a heart bursting with love and respect for you and anything that I can do in my daily life to spread the word of those who are still lost I will. If by any miracle there is anyone reading this who is away from home, I know how lost you feel in your head, in your heart, in every step you take. The paranoia, the lack of self-care, the aloneness of it all. Equally, I understand that everyone has a different story and different reason if indeed you had any control over that in the first place. But, if you can, make contact with Missing People, it’s a safe place, you won’t be judged, you won’t be told what to do but most importantly you won’t be alone anymore. My mum used to say “I love those walks where you just put one foot in front of the other”. It doesn’t mean there won’t be pain or cost or implications, only last week the last toe injury healed, a reminder to go gently, but it’s just what we need to do, take that first gentle step, make that first call, someone is there to help. People need to hear your stories, we’re listening.